The mayor has super-powers, but you probably knew that already! One of my favorite gifts is to light the Mayor’s Christmas Tree, a tradition started 13 years ago by Mayor John Landwehr, with the power of sending a direct signal to the North Pole that comes back to light our tree in Rotary Centennial Park. I must also thank Santa’s Elves (a.k.a. JC Parks) for making the tree sparkle. Last year, they decorated with 190 strands of lights and 1,200 ornaments! JCMO made Santa’s Nice List again this year! He’s always delivered what we’ve asked for. In 2015, we were excited to have our first ever Lincoln University student representative, Jonathan Jackson, on the city council; now we have Caroline Winjaro and a new LU President, Dr. Jerald Jones Woolfolk. We welcomed 25,000 visitors to the Historic Penitentiary for tours that year, and it’s now up to 35,000. We reminded everyone to wear their seat belts, whether it’s a primary law or not. Please #BuckleUpPhoneDown in your sleigh! In Jefferson City’s stocking, Santa gave us a new Boys and Girls Club and Special Olympics Training for Life Campus; the Ken Lanning Golf Course, the only fully accessible golf course of its kind, right across the river; and a new high school coming soon. And Santa, when you need to work off those extra calories after the holidays, just head to The Linc! Santa, I’m sure you’ve already heard, we’re trying really hard to get into prison, but in a really Nice List kind of way! Well, mostly nice, except for when we rocked down the prison walls when Wynonna, Travis Tritt, and Big & Rich ROCKED Inside the Walls! And the best present came from Governor Mike Parson when he signed the deed for 30 acres of land at MSP for redevelopment. Santa, soon you’ll be able to land your sleigh inside those prison walls. For now, the new lights of Capitol Avenue will guide you. And if you forget your sleigh, no worries — Spin bikeshare instead! Did you hear those Salvation Army bells? They’re the sound of hope for many in our community. Under Jefferson City’s tree, we bring toys and food for the Salvation Army and so many other worthy causes. Thanks to all who so generously give to others during this holiday season. Santa, most of all, we ask for another great year for the people of our wonderful capital city! We’re reminded of how thankful we are to be in the best country on earth, in the best city on earth, and for all the freedoms we enjoy today, such as the freedom to thank the good Lord for our wonderful community! We are also thankful for those who serve our city and country in law enforcement and the military. This year, we welcomed crew from the USS Jefferson City and USS Missouri. Our hearts and pride are always with them and their families. Back to the Nice List: how about all the children and students who sang and played their instruments at the tree lighting, and 7-year-old Hudson who helped light the tree last year? Santa, I know you heard about him raising money for hurricane relief with his lemonade stand. Santa, I think we’ll all agree that Jefferson City has been very good again this year! Now for the countdown: 10 . . . 9 . . . 8 . . . Join us Thursday, November 29! The Arts and Entertainment theme of this City Magazine issue had me intrigued and excited as soon as I heard about it — so much so that my first impulse was to immediately grab my paint brushes and get creative. Instead, I put a pen to paper for creative writing rather than watercolor! The magazine itself is a work of art, showcasing stunning photography that makes you want to explore all the sights and sounds that Jefferson City has to offer. That’s what I love about art — it’s broad. Art is in everything. Art surrounds us. Sometimes we notice it, other times it flawlessly becomes part of us without us even realizing it. One of my favorite pieces of art is the Missouri State Capitol. From every bit of its stately architecture to the walls inside and every ornate detail, it always blows me away. I’m constantly amazed each time I walk through the hallways and find myself taking photos of every beautiful angle. There is so much for our mind and eye to explore in the Capitol and beyond. Soon, the walkway bridge from the Capitol to the riverfront will bring even more inspiration! Art is my passion. If I could choose my dream occupation, it would be to play with paint. Happiness is a constant mix of paint and colors, and I always have the desire to capture our beautiful city on paper — or, in the case of my personal style, in acrylic on canvas. My favorite painting I’ve done currently hangs in the Capitol building, and the story is even better than the painting! Our giving community steps up for many causes, and we all give of ourselves. I’m often asked to donate a painting or photograph to charity auctions, and over a decade ago, I was inspired to capture Jefferson City’s 4th of July Celebration and donate my work to the Downtown Association fundraiser to keep our downtown vibrant. At the time, generous car dealership owner Mike Kehoe was the highest bidder, but nothing goes high without two people volleying back and forth at a live auction to keep up the excitement and dollars! In this case, Kehoe’s sparring partner was then Senator Carl Vogel. No surprise there. He was always supporting Jefferson City. Mike Kehoe “won” my painting, and it only made sense: They were the Kehoe fireworks, after all. Kehoe loaned the Capitol Fireworks painting to Senator Vogel to display in Carl’s Capitol office years before Kehoe himself gave political office a thought. Then, after the late, great Carl Vogel’s senate term had ended, the office became that of Senator Kehoe’s, and the painting proudly remained there. Now, in its latest transition, the painting has followed Mike Kehoe to the office of the lieutenant governor! I could have never dreamed that paint on that canvas — that art — could have such a special story. 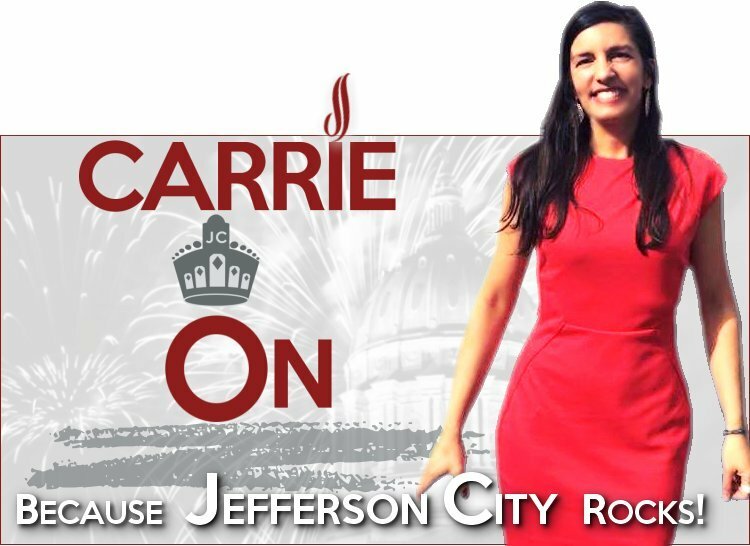 It starts with creative inspiration, capturing the dynamic #JCMO fireworks, and thanks to the generosity of our great community members like Lieutenant Governor Mike Kehoe, the story continues to grow. As an artist, it is certainly the highest honor, and as a mayor, it’s inspiring to tell that story, to remember those like Carl who worked hard for our state, and to see people continue to give so selflessly to our city. How did he do it? He was born in 1902 in Greece, poor, had nothing. Both of his parents died when he was very young. He often talked about how he sold his horse to get enough money to come to this country as a young boy with his uncle. That’s the extent of what I know about my grandfather’s family tree. Whether you asked him or not, he always told you he was a proud American through his thick Greek accent. He knew firsthand “if you work hard, you can make something of yourself.” What is work? Hard work? Working hard for your next meal. Trying hard as the first generation to provide for your family. Doing those sometimes dangerous jobs nobody wanted to do: taking care of the boilers, saving every dime, and eventually starting a business on Madison Street cleaning hats and shining shoes. He talked with a pride in his voice when he talked about his employees, many who also had these struggles. Long after he retired, he remembered them all by name. He then moved to High Street to start a dry cleaning business which transformed into Carrie’s Hallmark in ’76. He would still visit Greece occasionally, but this was home. He lived to almost 97 and always said that he never would’ve made it that long if he hadn’t come to America, and had health treatment that, though we take it for granted, many parts of the world do not have. He wasn’t always treated nicely. He was sometimes called names — that “darn Greek” — but he never let it bother him. He kept a positive attitude. He was nice to others, and it came back to him. He was always 39, Jack Benny’s age. When I would drive him down Missouri Boulevard, he would say he remembered when it was just fields. One of my favorite pictures of my grandfather was of him with his car in front of the Capitol in July of 1929 — his 27th birthday! He would say America is the “best country on earth.” I’ll proudly add that we live in the “best city on earth” too! How proud he would have been to be the Grandfather of the Mayor! He fiercely and passionately loved this country and often told people how he would handle things if he were president; he even wrote letters of advice to several presidents. The responses he received were taped to his walls, and I remember seeing and reading them as a young girl and thinking that was the norm — just tell the President what you think! So it’s not surprising that now the third generation “carries on” the family business and love of this community and country. God bless America! How did they do it, the generations that came before us, through hardships and challenges that we could never imagine? We are all made and inspired by their stories, and wherever we were made, we’re all #MadeinAmerica! “Proud of you.” I hear those words every day from my dad, Jim Tergin, the Father of the Mayor. Each time I hear them, I am reminded of the strength and encouragement that I receive from my dad, the kindest man I’ve ever known. He’s the son of immigrants. He’s a little brother, who, along with his sister and their pet chicken, Mary, grew up at Tergin Apartments (which still stands at Washington and McCarty Streets, one block from the Capitol), doing anything his big sister told him to do. My love of nature comes from Dad. If he’s not walking High Street or greeting customers, you’ll find him on the trails at the Runge or planting trees at the house. Yes, all those tiny stick trees in the yard are there on purpose. They will grow with his love and care! I inherited his artistic talent and his store, Carrie’s Hallmark Shop, which he named after me in 1976, when I was 4 years old. What is it like to grow up in a family business? Many would think it’s easy, that everything is handed to you. It’s true that it’s not work, per se, but it gives a new meaning to taking work home. As a family business owner, you learn that the two are actually one and the same. A truly successful family business is more than the family that runs it; it’s the generations of friends and customers who become like family. What is it really like to be part of a family business? You already know. Dad would give a piece of candy to some of our littlest customers, and now those customers come in to Carrie’s Hallmark Shop and tell that story to their own children. I am proud of you, Dad, for making an impression on generations of families. Dad recently received a resolution from Senator Mike Kehoe, 45 years to the day that my grandfather George Tergin received one, recognizing his service as a longtime business owner. Thanks, Dad, for serving our great country in the Army, and for being a longtime Shriner and Lion’s Club member. I hear the words “I’m proud of you” every day from Dad: at work, at home, as I’m driving down the driveway, among all of those stick trees in the yard. Those words — the pride Dad has in his mayor daughter — stick with me. I am lucky to hear those words every day, and I never get tired of it or take it for granted. Dad means it sincerely, every single time. The pride he has in his family grows constantly, and I share that same pride in our community as mayor. His pride and belief in me ends up being shared with the entire community. Never underestimate the power of those words and the need to hear and share them! My first mammogram was documented on the news when St. Mary’s had a “Mammathon,” so why not document my first colonoscopy? As mayor, I have a platform to get the message out — we should take care of ourselves. Thankfully, the press didn’t get word of my procedure, or they might have been there. My only regret is that I didn’t take a selfie, even though I’m sure most would want to keep this private. After all, why would anyone want to talk about this? Should I tell my neighbor why I was up all night? Should I tell City Hall why I wouldn’t be in that day? Of course I should, if for only one reason: to remind everyone the importance of health screenings, taking control of your health, visiting your dentist annually, getting eye exams, etc. Back to the colonoscopy. I armed myself with a pink Corkcicle cup to make the prep drink — the whole gallon of it — more bearable. Upon the first stip, I instantly realized I needed something to rescue my taste buds. I ran to the nearest gas station to purchase $10 worth of bubblegum, which prompted the clerk to ask, “Someone have a sweet tooth?” to which I answered, “No, I’m having to drink that awful prep for my colonoscopy tomorrow, so I need this gum for the terrible taste.” You should have seen the look on her face. I’m sure the young clerk was wishing she could un-hear me! My next colonoscopy tip: find mindless TV to get your mind off of the prep. I almost gave up in the middle of the night, thinking I really didn’t care what the results of this test would be, that I was done and couldn’t handle it. The nausea and exhaustion got to my head. My hospital transportation, Nurse Irene (a.k.a Mom), showed up bright and early the morning of. When we arrived, the anesthesiologist said I might be out of it after the procedure, so “be sure not to sign anything important while under the anesthesia.” I deeply regret that nobody came to me with a “Central Dairy Day” proclamation; I would have signed it instantly. I was glad to go under during the procedure. I needed the sleep. The anesthesiologist was ready to send me to my happy place, which I told him was “somewhere on a beach with Dierks Bentley,” but the procedure was so fast, Dierks and I barely got on the plane! Colonoscopy results are available instantly, and I’m thankful that my test was good. This procedure is lifesaving. Many problems, from digestive issues to cancer, can be found and treated thanks to a colonoscopy. To any who are avoiding this test due to embarrassment or thinking they’re fine: I urge you to do it. My grandfather George lived a full life to the age of 96. He wanted to live to 100, but colon cancer got him. So the doc says I’m good until my next one, which is great because I have enough gum to last me for five years. Thank you to Dr. Dundulis and the staff at Capital Region Hospital for making this awkward test an easy experience for someone like me who does not like to be a patient. A really great idea would be a prep that tastes like mint-chocolate-chip. I’m going to see if I can make that happen — whoever patents that will be a millionaire! There is a light at the end of the escape tunnel. Since the historic prison opened in 1836, there has been a fascination of what happened behind the walls of the Missouri State Penitentiary. What a story our community has to tell! The area surrounding MSP was once thriving with grand homes and industry, but over time, the area became blighted and undesirable, and many of the private homes were showing years of disrepair. But drive down Capitol Avenue today and you will see a renaissance of redevelopment starting to happen. New sidewalks, period lighting, streetscape trees — and those homes will soon be subject to requirements complying with code regulations to allow for revitalization. Each home has a story and a place in Jefferson City’s unique history. So what is going on with prison redevelopment? The Prison Redevelopment Bill passed the Senate and House, and SB 486 was signed by Governor Eric Greitens in July on the prison grounds. This bill allows the state to convey a portion of the property (approximately 31 acres out of 128 total acres on the site) to the city for redevelopment, using the state’s master plan as a guide. This plan includes a parkway, civic space, and hotel, all with a historic setting and a view of the river. Well, it already is! Now, the land conveyance expected in the master plan is not just a dream; it’s coming true. It’s in the numbers of visitors to the site, with tour members growing from 3,000 in 2009 to 33,000 in 2016, and attendance at the new MSP Museum, which grew from 752 to almost 7,000 over four years. That historic area will remain mostly untouched by development and will continue to host tours and events, including the very successful Concert Inside the Walls, which has featured Travis Tritt and Wynonna Judd. Mark your calendars for June 30 for the third annual Concert Inside The Walls! If only those walls could talk, right? Well, they sorta already do. You can hear conversations blending the natural with the supernatural, the past and the future, history and creativity and arts and entertainment and parks and trails and storytelling and learning. This site has it all. It borders Riverside Park, the Missouri River, historic Capitol Avenue, and the new Lafayette Interchange. Everything is aligning for success. Next steps include the city, county, state, chamber of commerce, and convention and visitors bureau joining forces to work toward selecting a developer so the dreams of the past can become a reality for our future. We don’t have to reinvent our city — we just have to reinvigorate what we already have, embrace our history as our future, and enjoy the “escape” to Jefferson City! I thought there was no way this mayor is going upside down. I’ll take my non-existent dance experience (including no gymnastics experience) and be happy to keep both feet on the ground. What if I embarrass myself? What if I miss a beat or forget a move? I soon realized Charles was serious, and I’ll never forget shaking with fear before that first flip. The trick is to build up momentum, give it a little “hop,” trust your partner, and have faith. It was much like deciding to run for mayor. When I ran, there had only been one woman in our city’s history to be elected as mayor, in the 1990s. The odds were not in my favor, but that never crossed my mind. When people say (with surprise), “You’re the mayor?” I proudly tell them I am the second woman to be elected mayor. It’s the same conversation when I run into mothers who introduce me to their young children and say, “See, a girl can be mayor!” I chime in and say absolutely yes, you can be whatever you put your mind to. Having recently being elected as vice chair of the Missouri State University Board of Governors, I’m now also on the first team of women, along with Chair Virginia Fry, to lead the board in the university’s history. I am proud to be an example that women are leaders, and we should all aspire to work hard to reach our goals, no matter our background, no matter what people may expect. It is certainly something to celebrate, and having women lead the MSU Board of Governors is a true example of that. We have two great leaders in the position of Chair and Vice Chair, we just happen to be women, and it’s great to be part of that history. All that’s to say that this dancing thing wasn’t the first time I had done something I’d never done before, and it was a lesson in letting go of the fear of flipping, worrying about an outcome, or what others would think. I certainly learned life lessons from the experience. Knowing when to lead and when to follow, and how to do both, is the difference between a beautiful dance and just jumping around all over the place. mayor-tergin-dancing-with-the-starsWe’ll never fly keeping both feet on the ground. Sometimes we need a little flip out of our comfort zone, a lift with some momentum, and partnership to make things happen. You could say Jeff City is flipping with forward movement. Just look at Capitol Avenue, the prison redevelopment and Wynonna’s Concert Inside the Walls on July 1, the Riverfront Access moving forward, a new high school on the horizon, the Linc, the Boys & Girls Club, the Special Olympics Training Campus, and everything else going on in our great city. I am now known as the Dancing Mayor, and if you call me the Flippin’ Mayor, I will take that as a compliment! Whatever you do #JCMO, just dance!